Irtiqa: How do students at elite Pakistani universities view the world? How do students at elite Pakistani universities view the world? I have recently returned from Pakistan, so some of the upcoming posts will be on Pakistan. I should first point to this absolute must-read article in last month's Newsline by Ayesha Siddiqa: The Conservatively Hip. The article cites results from a recent study that tabulated the opinion of 608 students from Karachi, Lahore, and Islamabad. The objective of the study was to "determine the socio-political attitudes of youth in elite institutions in the country's three major cities". The study is crucial as madrassas - catering mostly to the lower and lower-middle income class - are often solely blamed for the radicalization of Pakistan. But how do the students belonging to middle and upper-middle class view the world? On the one hand we see the proliferation of 24-hour music channels, hip coffee shops, and even fashion shows. On the other hand, we also see many pop-icons and cricket stars sporting long-religious beards as well as a general increase in public piety. So what did the study find? It appears that the new and upcoming generation from the elite universities is quite conservative - both politically and religiously. 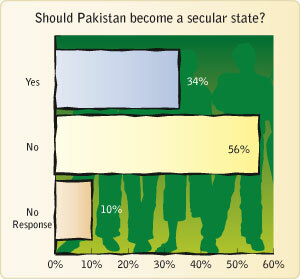 A majority of the respondents (56%) are against Pakistan being a secular state, and 62% versus only 26% agreed with the government's declaration of Ahmedies (a religious sect routinely suppressed and persecuted in Pakistan) as non-Muslims. Yes, you read it correctly. In 2010, only 26% had any issue with a whole group of people being declared non-Muslims by the state (in order to get a Pakistani passport as a Muslim, one has to swear that Ahmedies are non-Muslims. Instead of standing up against this state-sponsored discrimination, only a handful see this as being wrong). In case you are wondering, 18% also considered Shias to be non-Muslims (Pakistan has about 20-25% Shia population). Perhaps, what comes as a bit of relief is that a majority of these students at elite universities have a negative view of terrorism. At the same time, they predominantly ascribe the causes of terrorism in Pakistan to poverty - and do not necessarily see a link with radical worldviews (remember, Faisal Shahzad - the Time Square bomber, was not exactly poor). Furthermore, US, Israel and the West, beat out India to be the "greatest threat to the Muslim ummah". 1) First, Pakistan’s young adults abhor violence especially that which is directed against their own circle. 2) Second, they do not necessarily understand the link between their particular worldview and latent radicalism. 3) Third, they see terrorism mainly as a class issue rather than as a product of a peculiar mindset. 4) Fourth, there is a great affinity for religious norms and religious identity. 5) Fifth, there is greater political conservatism than earlier studies suggest, and this is reflected in a certain acceptance of the military’s role in politics. While these respondents did not totally accept the military as being reliable, they were even more vociferous in rejecting politicians and politics. 6) Finally, the youth were more accepting of the religio-political and geo-political norms established by the state on issues such as the status of Shias and Ahmedis and the country’s foreign relations. These trends were ascertained from the responses, some of which are being presented here. The basic idea behind the study was to explore the social and political attitudes of youth beyond the pre-conceived notion that all those who are highly educated are naturally liberal or reject militancy. It must be enunciated that while the majority rejected the very obvious symbols of radicalism and extremism, the mindset reflected a propensity towards latent radicalism. The trends uncovered here are influenced by the overall shift of societal attitudes towards latent radicalism as explained by the following four factors. Firstly, the greater emphasis on religious identity is a result of what the renowned scholar Farzana Sheikh describes as the Pakistani state’s bid to define citizenship according to the citizen’s putative relationship with religion. Consequently, the selection process has continued to narrow down from the general to the more specific. All minority groups, who do not meet their requirement, are hence dismissed as peripheral to the state and society. The dominant groups then engage in violence against them. The process of the definition and re-definition of a citizen sharpened during Zia-ul-Haq’s rule. A society that seemed fairly liberal and pluralistic began to cave in before the systematic campaign launched by the military dictator to Islamise society. Presently, the worry is not that the youth are more Islamic but that they have begun to relate to each other within the narrow confines of a peculiar interpretation of religious principles. Secondly, latent radicalism is also a product of Islamic social movements that grew or expanded during the 1990s through outfits like Al-Huda and the Tableeghi Jamaat (this is not to suggest that the Tableeghi Jamaat started during the 1990s). We saw children from the upper-middle and middle classes get inducted into these movements and change their perspectives about life and other people. These movements do not necessarily encourage jihad, but they shape the mind according to a certain theological interpretation, which can help create the likes of Faisal Shahzad and Omar Saeed Sheikh. Third, latent radicalism in society is owed to the so-called “clash of civilisations” that seems to have taken off in a big way after 9/11. George W. Bush’s reference to the “crusade” and the subsequent policies that the US adopted created a general sense of abandonment and insecurity among the elite. Having to take off their shoes at airports and being subjected to extremely humiliating body searches created a feeling of hostility, especially among the educated youth, to the western socio-political system. According to Dr Muhammad Waseem, who is a professor at LUMS, students hate the US, but at the same time they desire to go there for studies. Fourth, the above factors have added to the impact of militarisation on the Pakistani mindset. Militarisation begets further militarisation. These are worrisome factors and trends. Nevertheless, systematic studies like this one are essential in understanding how Pakistanis are viewing the world. If you have time, please do read the full article. The very mention of Ayesha Siddiqa at the start of this post points towards the absurdity of what is coming next. My personal analysis of this woman is of a paranoid pseudo-analyst, who also behaves like a conspiracy theorist and propaganda mouth-piece, and would go to any length to sniff Pakistani military boot even on the carcass of a dead seal at the shores of Kerguelen Island. You visited Pakistan. I wonder if you had visited Karachi, our team of Karachi Astronomers Society could have benefited from your astronomical expertise. Quite a lot of stuff going on at astronomy scene in Karachi. I could not visit your website from here in UK for a few months, as I mostly rely on the hospital internet where your blog was blocked by the IT department, perhaps due to the very mention of "religion" in the name of your URL. Totally missed your visit to Pakistan and our team remained unaware. No I did not get a chance to visit Karachi this time. 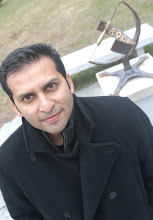 However, I'm aiming to visit Karachi in March of next year and, of course, would love to connect with astronomers there. Sir, the two faced attitude of the western psuedo-intellectuals is alarming. It lacks credibily and integrity. At one end the west professes democracy and freedom of choice. But when th majority of well educated students from elite universities are rejecting these so called democratic values with a depleted social and economic system, this doesn't go down your throat. Also, the idea that saying tableeghi jamaat is propagating latent radicalism is laughable (I am not a tableeghi but some of my friends are). "latent radicalism is also a product of Islamic social movements that grew or expanded during the 1990s through outfits like Al-Huda and the Tableeghi Jamaat (this is not to suggest that the Tableeghi Jamaat started during the 1990s). .....These movements do not necessarily encourage jihad, but they shape the mind according to a certain theological interpretation, which can help create the likes of Faisal Shahzad and Omar Saeed Sheikh." so the opinion of one person makes it true? what evidence does she have to back this claim? i say she is as biased as they are!